This entry was posted in book review, France, John Dickson Carr. Bookmark the permalink. The Bencolin novels aren’t rated very highly among Carr aficionados — largely I think, because of that flowery writing you mention: they’re a bit Gothique. Me, on the other hand, I love ’em, and if anything the flowery writing adds to the love! I’m glad you enjoyed this one, Bernadette. Carr really was a master of the ‘impossible-but-not-really’ sort of crime, and I respect him for that. I’m glad you noticed the character development, too. In my opinion (which is by no means universal), Carr did characters better than one might think. And a wax museum – what a deliciously eerie place to have a murder. I really like the setting on that score. Glad I haven’t put you off Carr all together! (JJ would never forgive me lol). 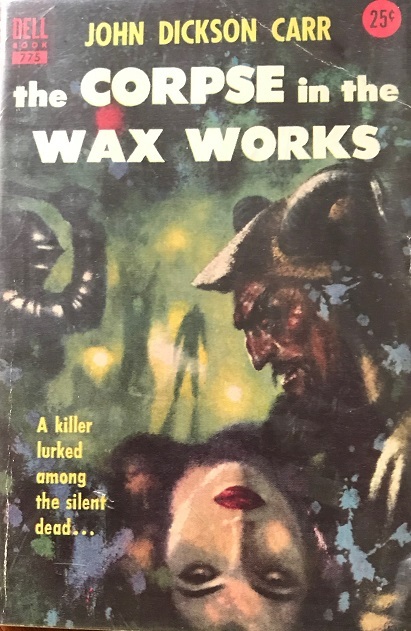 Carr’s work is quite variable in quality and style as he once he starts approaching the 1940s he wrote a number of suspense filled but non-gothic styled mysteries such as The Emperor’s Snuffbox and The Case of the Constant Suicides (two of my personal faves). They might be a good place to start, though I imagine others will have their own recommendations. Yeah, if you’re not convinced about classic GAD in general, you could do much worse than The Emperor’s Snuff Box — not vintage Carr, but a good story that covers a lot of good ideas with a minimum of flowery prose! -Carr always had a bit more flowery writing than most, but this element is more prominent in the earlier books. -The Corpse in the Waxworks is incredibly light on any impossible element, to the point that most Carr fans wouldn’t even consider it to be an impossible crime. -As famous as Carr is for his impossible crimes, he perhaps excels even more in having a well hidden killer. You definitely experienced an example of that with this one. -The notion of a young man view-point character and a romantic interest is present in all of his novels. Others have provided you the excellent recommendation of The Emperor’s Snuff Box. If you enjoy that and want to try some other books that are representative of Carr’s wider work, try The Problem of the Green Capsule and Hag’s Nook. Thanks so much for the comments and recommendations of good choices from his long list for me to look for. I am definitely not an expert on impossible crime mysteries…my only thoughts on this one fitting the description was the reliance upon timings of the comings and goings at the two buildings…but the identity of the killer was exceedingly well hidden…sometimes I don’t like that but here I did think it played fair and the motive was realistic too…sad but realistic. I see people talk about Carr so much that I’m willing to give one of his books a look in future to see what the fuss is about. I’ll start with the titles provided in the comments. I’m not a fan of Spillane either. I’m glad to have been prompted to read him Keishon…definitely not what I was expecting and I’m quite keen to try the others that have been recommended by knowledgeable types.